The crew at Prolong certainly “get it”. We can tell by the fact that they are involved in so many events across the country each year and we can tell by their taste in project cars to represent the brand. Their latest in the project category is a 1955 Chevy 210 four door wagon that is an homage to all the great drag racing support and push cars of days gone by. When top fuel cars were run by groups of local guys, they’d heave their tools and hopes into a wagon and set out for greatness. Most times that same wagon pushed the race car to the starting line and down the fire up road at the track. Hell, some guys slept in them, too. Prolong tapped Steve Strope to lead the build and they have partnered with a wide array of companies like Hedman, Edelbrock, Rocket Racing Wheels and a host of others to complete what will surely be a head turning wagon when it is done. The wide rubber in the rear and the cheater slicks really make the whole look and attitude of the car perfect. We’ll be following this one as it gets built through update videos and photos via Prolong’s social media. Think they’ll let us drive it? READ ON FOR THE FULL RELEASE FROM PROLONG! 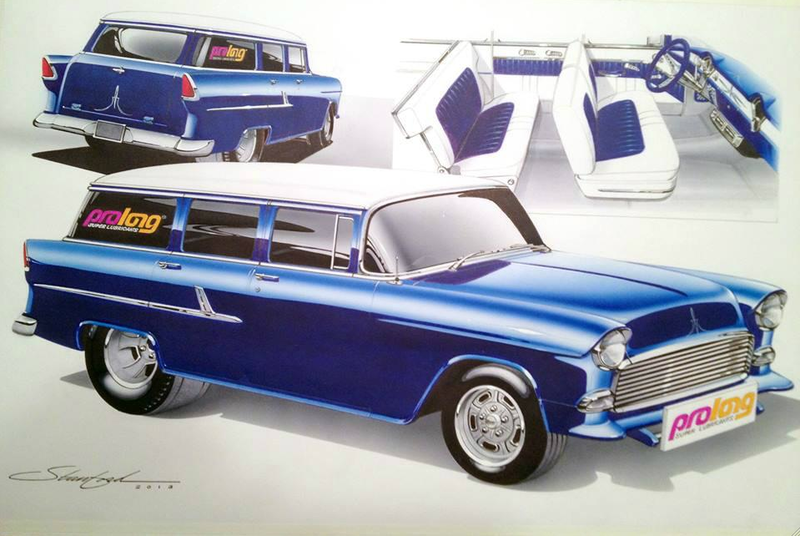 POMONA, Calif. – Staying true to the earliest days of drag racing, Prolong(r) Super Lubricants will soon unveil a 1955 Chevy 210 four-door Wagon, styled after the classic Drag support vehicles, which were fixtures at drag strips across the country in the 1960s. The slick vintage wagon was inspired by Prolong’s staunch support of the classic car, hot rod, nostalgic and drag racing industries. Built to serve as a true working vehicle, Prolong’s ’55 wagon will make appearances at car shows and other events throughout the country all year long. Apogée attributes the high-quality and originality of the build to project lead Steve Strope of Pure Vision Design, and a number of industry-leading contributors. The Prolong Wagon also will feature the classic front push-bar indicative of ’60s support vehicles, as well as accessories, design features and details representative of the era. In the early 1960s, drag racing was growing in popularity across the United States, but corporate sponsorships remained scarce. Drag enthusiasts were not daunted, however, and used their family wagons to pull trailers and cart tools for the dragsters, which literally had to be push started. Throughout the build, Prolong will feature the vehicle on its Facebook and Twitter accounts, under its “GoProlong” handle. A series of build-up videos also will be posted on YouTube and Instagram. A complete listing of components and contributors will be available closer to the vehicle’s completion. Prolong(r) Super Lubricants, a brand of GoldenWest Lubricants, Inc., produces a wide range of chemicals and car care products, including engine, fuel and transmission additives; chassis and wheel lubricants; vinyl and leather protectants. Prolong’s Anti-Friction Metal Treatment(tm) (AFMT) advanced technology treats and modifies the surface of metal to reduce metal wear, heat and friction. For more information, visit www.prolong.com, or contact Prolong at 1937 Mount Vernon Ave., Pomona, Calif., 91768; phone: 800.540.LUBE (5823); fax: 800.966.LUBE (5823). In August 1973, cheating in the Soap Box Derby made national news Video Bonanza: 1960s and 1970s Vintage Dodge Truck TV Commercials With Don Knotts Action!